Dana York is best known to the media as the widow of the late rock and roll legend, Tom Petty. She was thrust deep into the limelight following the tragic death of the musician on the 2nd of October, 2017. According to reports, she was the one who put out the 911 call after Petty had a heart attack that would eventually lead to his death which was later discovered by the Los Angeles County Department of Medical Examiner-Coroner to be caused by mixed drug toxicity. Here are the facts you should know about the woman Petty spent his last years with. Dana York Epperson was born in 1964 in Flint, Michigan and raised in Genessee County, Michigan. Her mother lives in Fenton, Michigan. Almost everything that is known about Dana York dates to after she got married to the superstar rocker, Tom Petty and that is because unlike her late husband, Dana York was just a normal person living in Michigan like every other average American. Before her relationship with Petty began, Dana York worked in education. She attended Flushing High School in Michigan from where she graduated in 1982. Her career in education includes a period when she served as the principal at University High School in Ferndale, Michigan. However, upon beginning her relationship with Tom Petty, Dana had to resign from her education job and began working on Petty’s band, helping them schedule their tours. Before Petty came into the picture, York was married to someone else. As of when she first met Petty in 1991 at a concert in Texas, she was still married to her first husband. Also, Petty was still married to his first wife, Jane Benyo. However, Petty’s relationship with his wife began to turn sour and the two eventually got addicted to drugs which further took a toll on their relationship and culminated in their divorce which was finalized on September 9, 1996, bringing an end to a marriage that lasted for over two decades. Coincidentally, York also had issues with her first husband and the two would also divorce the same year in 1996. York reconnected with Petty that same year and despite just experiencing heartbreaks from their previous relationships, they immediately fell in love and began a romantic relationship. York and Petty would go on to date for 6 years before tying the knot on the 3rd of June 2001 at the Hard Rock Hotel in Las Vegas. The wedding was a private one with just close family and friends in attendance. A post-wedding celebration was held at Ruth’s Chris Steakhouse in Vegas. Had it not been for Petty’s marriage to York, he probably would have passed away earlier than he did due to drug addiction. For the first few years that they were together, York didn’t know about Petty’s addiction problems as he hid it from her. However, she eventually got to know and ultimately helped the musician get the help that he needed. Tom Petty would come to openly credit his wife Dana with saving him from drug addiction. Dana York and Tom Petty never really got to make babies together, but each of the lovers had had kids before beginning their relationship. Dana York has a son named Dylan from her previous marriage. 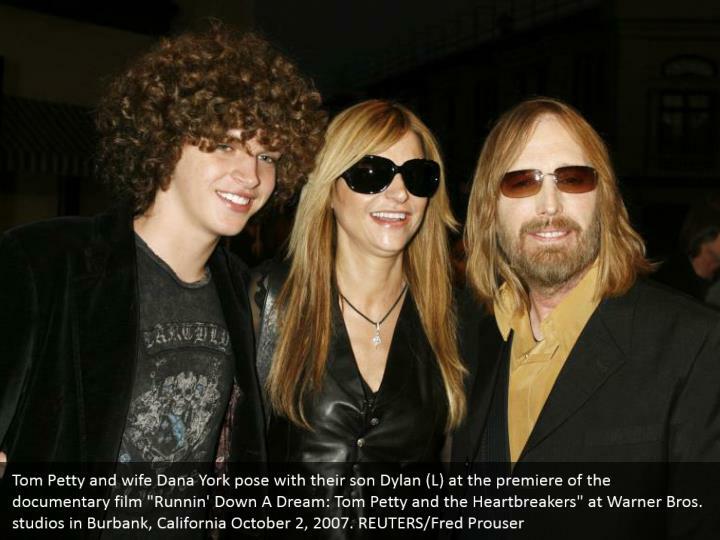 When Petty was alive, Dylan whom he adopted was occasionally spotted with him as well as with his mother Dana. Upon her marriage to Petty, Dana York became the step-mother to Petty’s kids from his previous marriage. The kids are daughters – Adria and AnnaKim Violette. Both kids did inherit their father’s artistic genes. Adria is doing well as a film and music video director. She has directed the music videos of top stars like Coldplay and Beyonce. Annakim, on the other hand, is doing well as a fashion designer as well as an artist. • Dana York’s own father also battled with drug abuse and her experience with him is what helped her to pull Petty out of drug addiction. • York and Petty actually wedded twice. Their first wedding which was held in Vegas, per Petty’s word to PEOPLE, was just to settle the legal side of things. The couple wedded again a few weeks after the initial one in a bigger ceremony held in their Malibu home. The pop star, Little Richard officiated the ceremony. • Upon waiting for the ambulance to arrive after Petty passed out, York performed a CPR in order to revive her husband. • Dana helped Petty restore his relationship with his daughters.